The original Lunar: Silver Star is one of the least popular well-remembered JRPG's of the 16-bit generation. There's no doubt that this era was one of the JRPG golden ages with original IPs breaking new grounds for the genre. When the Sega CD arrived, Lunar's main innovation wasn't anything that hadn't been done before. 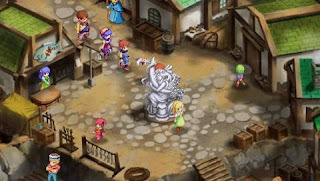 It gained recognition for taking a conventional JRPG storyline and making it a focused character piece, with particular attention paid to the setting.rather than any genre-defining plot. 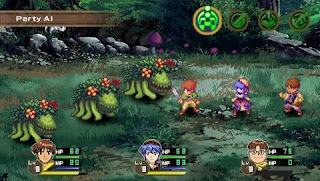 The other notable part of this game and its sequel is the numerous number of ports, with the latest version being for the PSP. The question is, how does it hold up? The other notable part of the series is the game's translation. The SEGA-CD original and the subsequent PSX port were translated by Working Designs which can be credited as the first group that localised video games rather than translating them. On occasion they'd remove content (S.O.S) or change game mechanics which renders the game unplayable (Silhouette Mirage) but in Lunar they took the "timeless" humour from the original and replaced with with out-of-place pop culture references, censoring and very 90's humour. The PSP version is translated by XSEED, who pride themselves on translating the Ys series, a series of action RPG's that are mostly unknown in the West. XSEED are masters at their craft as the translation for the game is excellent. The game's presentation as a whole is one of the game's biggest positives with beautiful hand-drawn animated cut-scenes that alone are worth progressing through the game for. The music is composed by Noriyuki Iwadare and the composer of the Phoenix Wright series continues to put out excellent music to this very day. The sprites and character portraits aren't that bad either with the game's animé style somehow being cliché and original at the same time. It's a shame the rest of the game is so terrible. For a game that prides itself on character development, the characters themselves are incredibly shallow. The dialogue itself isn't the problem (XSEED does a good job with what they're given) but the clumsy exposition handling, the face palm inducing plot revelations and the inane decisions that half the characters make make the game almost unbearable to slog through. It doesn't help that even the game seems disinterested in itself. The half-minute load times are enough, the bare-bones game play that brings all of the worst parts of Dragon Quest and add the FFVII Limit Break to it to give the minimal amount of tactics to the game that fail to make the game any more fun. Lunar is and will always be a relic of its time. Other JRPG's of that era (most famously Final Fantasy 6 and Chrono Trigger) are still played to this day because these games are at their fundamental core, fun to play. Lunar was a rare novelty at the time of its release, boasting a world that was unknown to video games and offered something we had never seen before. It's now 2012 and it has been seen before, many times, in many better games. Lunar should be judged on its own merits but it's lackluster even when it is and I don't recommended it to anyone who likes JRPG's. This was one of the first PSP games I got for the system when I picked mine up. I lucked out and got a complete Limited Edition which is awesome. The music in this game is and always has been wonderful, so you get a soundtrack! (Makes 2 I own now with my PS1 WD release). The deck of risque cards is probably the best thing in the box though. Its total fanservice, all the girls of the game dressed provocatively and in sensual poses. Makes for some fun misogyny talk.